Over a dozen faithful Catholics joined forces with the American Society for the Defense of Tradition, Family and Property on August 24, to protest the blasphemous play, “Corpus Christi” at the Metropolitan Community Church of Los Angeles, California. The play portrays Our Lord and the apostles as homosexuals. As a result, the TFP has protested this blasphemous whenever it has appeared. The protest took place in a residential area which meant that it was a high traffic area for both automobiles and pedestrians. 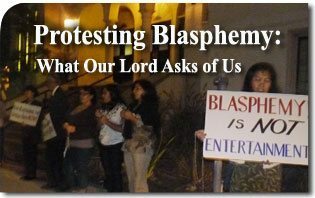 Many of the people that passed by gave them the thumbs up or nodded in support showing that publicity is needed when protesting a blasphemy against the most Sacred Person of Our Lord Jesus Christ. This entry was posted in Anti-Blasphemy by The American TFP. Bookmark the permalink.